What's the best heart to burn fat? Since the early seventies heart rate monitors have been used to monitor our exercise levels and give us an accurate measurement of our body workout intensity. Over this time many people have used heart rate exercise charts for guidance on fat calorie burning. These are simple graph's that show the output of our heart rate levels. The graph gives you an easy guide to show what you increase when conducting cardio exercises at different heart intensity levels. On a brief view. The chart quickly shows us the best heart rate we need to exercise at in order to burn more fat. Since using the exercise zone chart for guidance, we've learned that our best heart rate for burning fat is the fat burning zone 65 - 70% of your maximum heart rate (MHR). In the heart rate chart,it states that we need to exercise for 30 minutes continuously at the heart rate zone of 60%-70% in order to burn fat more efficiently. 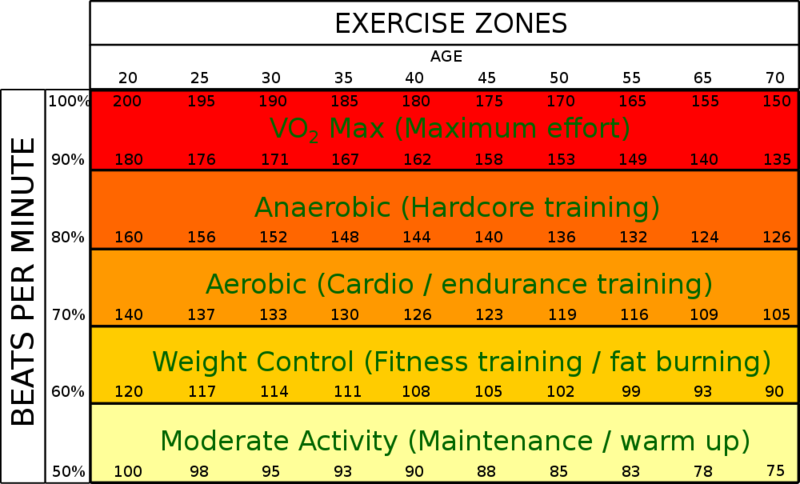 This zone is the guideline for all exerciser's of all ages but isn't 100% accurate. If you wish to have a more personalised approach here's the formula for working out your own personal fat burning zone. In order to burn more fat, you first need to identify your correct heart rate fat burning level. Please follow these steps below to work out the calculation. Now you have your personalised percentages. Most trainers advise that in order to burn fat you should complete cardio training exercise (i.e running, cycling) for minutes between 65% and 75% of your MHR. Why? Recent research on effective fat burning shows that people who exercise with high-intensity intervals (HIIT) for a shorter period of time are three times more successful at burning fat than normal cardio exerciser's that use fat burning zone chart as a guideline. These studies found that a group of men that completed twenty weeks of interval training, lost nine times more fat than that from men who exercise regularly between the fat burning zone 65-70%. Between 60-70% maximum heart rate, is not enough! A fitness professional would tell you if want to burn fat then you need to get wet, often training between the 60%-70% workout zones puts you into a world of ease, making it easier for you to fall short of your target distance and finish early. If you train in the gym then most of the cardio machines will have a pre-set button for interval training. If your training outside then the best way is by using a heart rate monitor, this is easier and more personal, you can be sure to reach the correct levels for your fat burning workout. First, complete the workings your personal MHR with the steps shown above. Make the following calculations and write these down. Once you have these calculations you can start. Make sure you warm up and cool down before sessions. 1st Session - 75% 2 minutes - 80% 2minutes - 85% 2 minutes - 80% 2 minutes - 85%- 1 minute - 75% 5 minutes. 2nd Session - 75% 3 minutes - 80% 3 minutes - 85% 2 minutes - 80% 3 minutes - 85%- 1 minute - 75% 5 minutes. 3rd Session- 75% 2 minutes - 85% 2 minutes - 75% 2 minutes - 85% 2 minutes - 75%- 2 minute - 85% 2 minutes. You need to adjust the training to your fitness. If it's too easy to complete the session then you will need to complete this routine twice or increase the time. The most important base for HIIT training is that you keep changing the levels constantly. Every session should be different. The distance is normally 50 to 100 meters from tree to tree. Another way to do this is by using a watch, set an alarm to activate every 45 seconds then follow this method. Fitnesshealth is not responsible for any injury's caused and we advise check with GP before conducting any exercise, these exercises are not recommended for people with high blood pressure.